LogPoint - SIEM - Symtrex Inc.
Symtrex has partnered with Immune Security, the developers of the advanced Security Information and Event Management platform – LogPoint. 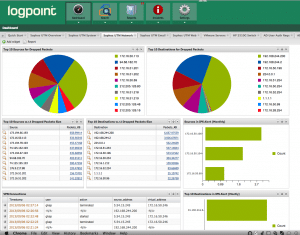 LogPoint version 5.1, introduces an advanced Security Information and Event Management (SIEM) platform. LogPoint enables the correlation of events and reporting on critical business operation in real-time, allowing enterprises to gather insight and understand the context of the billions of events generated daily by both core business applications as well as the infrastructure supporting and enabling the business. LogPoint provides a rich analysis platform and out-of-the-box dashboarding and reporting for infrastructure and critical business applications, enabling effective management and measurements of the enterprise security. Perform analysis of security events and APTs. Automate and optimize the time spent meeting e.g. compliance and regulatory guidelines. Articulate and define the efficiency potential within the enterprise. Gain substantial time-reduction when conducting root-cause analysis. By leveraging LogPoint, it is possible to provide assurance towards auditors, authorities, and other third-parties that the enterprise is managed and monitored in a convincing, credible and timely fashion. Contact us today to find out more about the LogPoint SIEM, download the LogPoint Product Datasheet or to signup for one our webinars.